While my entire home includes a water filtration system, meaning my shower, faucets, laundry water – everything is purified for safe drinking and bathing through an Ionic’s System, I can foresee in upgrade in the future given some recent events. 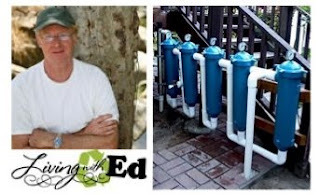 A few posts ago, I wrote about Gray Water Recycling Systems (GWRS) and this company’s spokesperson Ed Begley, Jr. a well known environmental activist and celebrity, who are both working to make a difference. At its core, GWRS manufacturers gray water purification and disinfection systems for residential and commercial use. Units capture water from shower, bath and laundry, then purify, disinfect, store and deliver that water to be safely reused for irrigation and other recycled water uses. Their tenacity and years of dealing with ugly, stinky water has finally paid off as the South Bay Business Environmental Coalition (SBBEC) has awarded their 2009 SEED Award for Water Conservation to Gray Water Recycling Systems, LLC. The SEED Awards (SoCal Environmental Excellence Development) are given to Southern California businesses that have exhibited excellence in helping to improve environmental sustainability and quality of life in the greater South Bay Area of Los Angeles. I couldn’t agree more as GWRS was selected for extraordinary work in the area of Water Conservation category for their significant and notable efforts to help reduce environmental footprints.